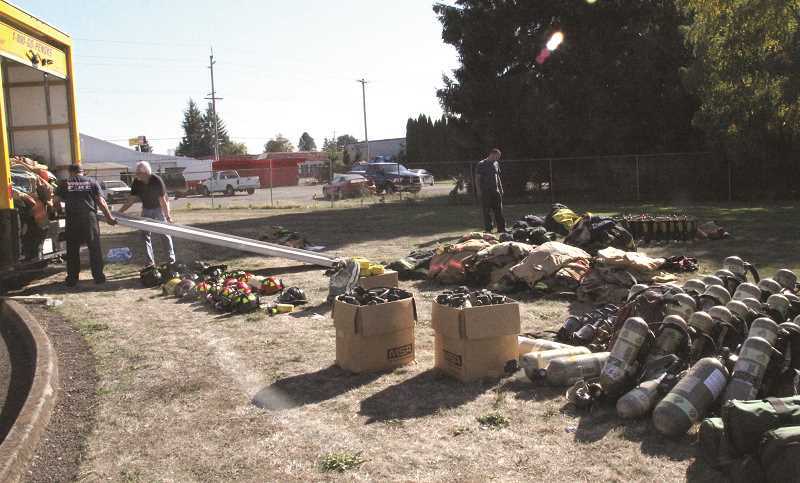 Ill-equipped volunteer fire departments in Mexico are now better prepared for emergencies thanks to a recent donation coming out of Woodburn. 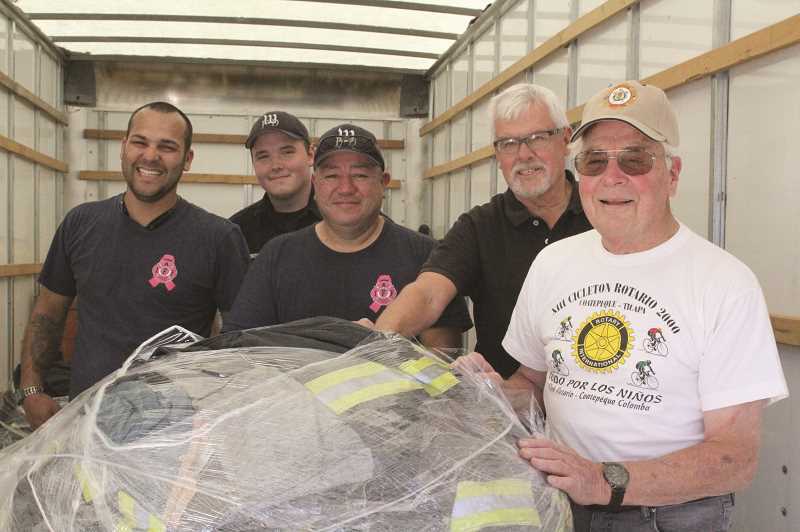 Woodburn Fire District firefighters have organized the donations, which come from WFD, as well as fire departments in Hubbard, Sheridan, Portland, Pleasant Hill, Mount Angel, Aurora and Lane Fire Authority (Lane County). Transportation costs have been donated by Rotary Clubs of Woodburn and East Salem, as well as the West Salem Rotary and the Salem Sunrise Rotary clubs. In fact, East Salem Rotarian Phil Sperl drove the truck to the Arizona-Mexico border last week. "If not for them, then this couldn't happen," said Woodburn volunteer firefighter Juan Armenta, who has been organizing these supply drives for Mexican fire departments for 13 years, along with Raul Garza, a staff firefighter. Donated items this time around included medical supplies like bandages, turnouts, boots, helmets, 51 pants, 100 coats, nearly 300 bottles of oxygen tanks, masks, defibrillators and 34 airpacks. The items have been collected over the past two years or so before volunteers decided it was time to send a truck down to Mexico. "The equipment is still in service but is outdated so we can't use it (due to regulations)," Garza said. "They put date stamps on everything. But it makes a difference there. It's going to give them more protection than what they have there." Armenta, who himself was a volunteer firefighter in Mexico, said the fire departments there are not government funded, so firefighters have to supply their own equipment. It's incidents like a daycare center fire in 2009 in Sonora that killed nearly 50 infants and toddlers and injured 40 others that motivates Armenta to give. He reached out to Garza and the two, on their own time and their own dime, gathered donations to send to Mexico. Before long, the local Rotary clubs jumped onboard. "We got involved because we had a project in Guatemala and we got to branch out to help in Mexico," explained Erik Larson, an East Salem Rotarian who helped load the truck a couple weeks ago. And donations have already been shown to be beneficial. "The first defibrillator we sent actually saved a life," Garza said. Since Armenta and Garza started the donation collecting 13 years ago, one fire truck, two ladder trucks and three ambulances have been donated. Most have gone to volunteer firefighters in Nogales, a city on the border of Arizona and Mexico. In fact a bin of air packs from this month's trip were donated to the Nogales, Arizona, volunteer fire department. "They have close to 18 volunteers and not enough equipment," Armenta said. But the majority of the latest batch of donations has gone to firefighters in the city of Culiacan. The Culiacan Rotary Club is working with local clubs to ensure the donations are delivered and used appropriately. "If a department can't use it then they give it to the neighboring departments," Garza said. "There's an agreement with them." The partnership has extended beyond donations. Just this past May, Jesus Roberto Martinez, fire chief of Bomberos Preventivos de Nogales, brought his fire prevention education program to Woodburn. The program, which is a puppet show, was developed to increase fire awareness among children in Nogales and has been a success, with zero children fire deaths since the program launched. It's that desire to make a difference that spurs on the volunteers, particularly Armenta, who realized how much more he had available to him when he moved to the United States. "I always liked to help people and to help the community," he said. "When I came here I thought, I can do something even better."